We’d love your help. Let us know what’s wrong with this preview of Split Second by Douglas E. Richards. A stunningly unique time travel thriller. The 27th bestselling Kindle book of 2017--out of almost 6 million titles. What if you found a way to send something back in time? But not weeks, days, or even minutes back. What if you could only send something back a fraction of a second? Would this be of any use? You wouldn't have nearly enough time to right a wrong, change an ev A stunningly unique time travel thriller. The 27th bestselling Kindle book of 2017--out of almost 6 million titles. SPLIT SECOND is a roller-coaster ride of a thriller, one that will have readers pondering the nature of time, and of reality, long after they've read the last page. To ask other readers questions about Split Second, please sign up. Do you think is there an open ending with the Schlesinger character? The cellphone when duplicated in the novel is only a singular piece each time. Surely if it duplicates exactly both phones would be programmed and therefore the number of phones would increase exponentially ? Returning from a visit to her sister, Jenna Morrison is surprised when her physicist fiancé Nathan Wexler announces that he has made a major breakthrough, but before he can tell her anything armed men break in and kidnap them. They are taken to nearby Palomar Mountain with no explanation only for another group of men to ambush them on route. Nathan is killed in the crossfire, leaving Jenna to try and find out what earth-shattering discovery would lead two highly trained groups of black ops speci Returning from a visit to her sister, Jenna Morrison is surprised when her physicist fiancé Nathan Wexler announces that he has made a major breakthrough, but before he can tell her anything armed men break in and kidnap them. They are taken to nearby Palomar Mountain with no explanation only for another group of men to ambush them on route. Nathan is killed in the crossfire, leaving Jenna to try and find out what earth-shattering discovery would lead two highly trained groups of black ops specialists to want it so bad. Time travel that only works by fractions of a second? A brilliant concept. If only someone would write a book about it. This book is about two supposedly elite black ops groups hunting after a mcguffin in the form of a flash drive containing Wexler's research while Jenna and her invincible detective friend run around learning detailed histories about places and things. It is 112 pages before the concept advertised on the cover even gets hinted at, and then a further 90 pages before anything is done with it. Even then it never really lives up to the hype the blurb is selling. Mostly, the characters sit around discussing movies the author likes and getting stumped by basic concepts such as time moves forward or light speed. Lengthy discourses are given on pretty much every topic except what would actually be relevant to the subject. At one point one of the characters tells a villain to get on with explaining what is going on and he replies with, and I kid you not, "Later, but first more Backstory!" Any time the conversation approaches explaining anything, the characters find some reason to drop it and never come back to it. Never once is the technobabble for the amazing time travel technology everyone is after addressed, and yet the author finds the time to lecture about everything from Zeno's Arrow to Maxwell-Faraday to the entire history of every location they visit. I'm glad he had fun doing research, but not even bothering with the pseudoscience that is supposed to be central to the story is really pushing it. I don't care what kind of sandwich you had on the way over here when we were talking about horses. What does get discussed is highly inconsistent. The characters waver between being utterly incapable of grasping what seems to me to be pretty straight forward concepts to being suddenly well-versed on a subject because they've seen a few movies. They spend twenty odd pages failing to understand the concept that time exists and yet they claim to fluently comprehend Many Worlds theory and branching timelines to the point where they can determine the exact manner in which their universe functions, somehow, because of reasons. Things that could be explained in a few short sentences are dragged out through several overly long chapters before ending with the characters claiming it is too confusing to ever be understood. Either I have a genius-level understanding of all the concepts involved or the delivery is so mangled that at no point does it venture anywhere near being as complex as the characters make it out to be. That's not even approaching the matter that the two supposedly elite black ops groups seem to have no idea what they are doing. Cargill's Q5 team even at one point acknowledge that their leadership is clearly incompetent. None of them act like they have any military training despite the constant exposition exclaiming how skilled and organized they are. Somehow, Knight's Brain Trust™ is even worse about it, even though he handpicked the best of the best and claims to be a world-class intellect, people are able to run circles around him with only a few admittedly clever ploys. For much of the book it's pretty clear neither side knows what they are doing. A key piece of technology can only be operated by two people in the entire world, who happen to be the leaders of each faction, and only them. To me, the smart move for the evil side would be to have one of their double agents take the other out, something that later chapters show wouldn't be too difficult, and they'd automatically win, and yet neither side even seems to consider it. When it finally does get up to the whole time travel gimmick, it gets to feel like people just want to use the words 'time travel'. Much of what they do with it is more in the realms of 'time displacement' if anything. There is very little 'travel' involved. At one point, the characters panic over the universe being reset every time the machine is used and all I could think was why do you care?! It is less than a second in one very localized location, you will never even know if anything changed, so why does it matter? The characters state that the way time works is that there is only one universe that gets rewritten with any changes remaining in the past, like a file being saved over an older version, a statement that no one seems to want to back up with an explanation. The author states in his end notes that he picked this method because he found the infinite branching of Many Worlds theory confusing, which in itself isn't a problem, if he didn't keep implying that this is some completely new approach that he's come up with, neglecting that this is the popular method known as the saw-tooth timeline. A style made famous by the Terminator series. The reveal of why the two sides are so eager to get their hands on Wexler's research is long in coming. Two thirds of the book and the villain's entire lengthy monologuing backstory go by before the answer is give and even then it largely undercuts everything that has happened up until that point. It then takes longer for them to state a clear reason why it even still matters. What possible use could a time machine that only goes back a fraction of a second have? While I will admit that the final reveal, (view spoiler)[a matter duplicator/teleporter (hide spoiler)], is actually a pretty clever use for it, the characters do touch on and quickly discard one of the more practical applications out of hand without a second thought. A half second is a lot of processing time for a computer. Backwards verifiable information would make quantum computing a breeze. I do not give out one-stars lightly, but this book left me wishing there was a lower rating I could give it. I have no idea if others share my opinion, but I have never read something so infuriating before. Just thinking about it makes me stressed. I do not even have words to express how much I disliked this book. It has shortened my life span. A horrible choice that I regret bitterly. I'm trialling Kindle Unlimited. Actually, I'll tell the truth, my book Deadly Messengers is gathering quite a few page reads via Kindle Unlimited, and I wanted to have a nosy around what was on offer and why it was being read so much. 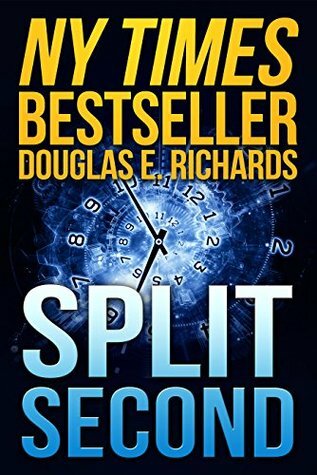 This book Split Second by Douglas E. Richards kept being recommended to me by Amazon's algorithms and it sounded intriguing. I love techno thrillers, and since Michael Crichton's untimely death I haven't found anyone who can write a cracking adventure and throw in c I'm trialling Kindle Unlimited. Actually, I'll tell the truth, my book Deadly Messengers is gathering quite a few page reads via Kindle Unlimited, and I wanted to have a nosy around what was on offer and why it was being read so much. This book Split Second by Douglas E. Richards kept being recommended to me by Amazon's algorithms and it sounded intriguing. I love techno thrillers, and since Michael Crichton's untimely death I haven't found anyone who can write a cracking adventure and throw in credible techno elements. So Douglas E. Richards, I thought, show me what ya got! He's got a lot, good readers. This book starts off with a bang, with one of the main characters being murdered before his girlfriend's eyes. I love the 'how' and 'why' of this book. It isn't about whodunit, it's a whydunit. Poor Jenna and her brilliant live-in lover Nathan Wexler are captured one night by a military group and Nathan is killed when the kidnappers are ambushed. Jenna is left fleeing for her life and alone, until she contracts and ex-ranger now private investigator to help her. What follows is a cat and mouse chase, while the two of them try to figure out why the time travel project Nathan was working on is so important. He'd created time travel, but it can only send you back in time for less than a second? What is the point of that? You can't change anything in less than a second. The answer is intriguing and a real mind-bender. I love time mindbenders and Richards sure knows how to spin one. I'm going to read more of his books now. If you like your thrillers, taut, terrific, and filled with mind-blowing twists, then this is the book for you. I don't often give 5 stars, but this was a standout for me and a unique plot. If you know anything about computers, and you don't like to read something that is the book equivalent of a action movie (like fast and furious, or taken) you will most likely hate this book. If you think the cloud is actually in the cloud, if you think anyone calls the internet "cyberspace", if you need someone to explain to you what a flash drive is and why it's also called a thumb drive, and you like a book where you don't learn anything about the characters before people start dying then you If you know anything about computers, and you don't like to read something that is the book equivalent of a action movie (like fast and furious, or taken) you will most likely hate this book. If you think the cloud is actually in the cloud, if you think anyone calls the internet "cyberspace", if you need someone to explain to you what a flash drive is and why it's also called a thumb drive, and you like a book where you don't learn anything about the characters before people start dying then you will love this book. ******Disclaimer I only made it to chapter 7 before I threw the book out. How many thousands of men had America lost fighting the advance of barbaric hordes of Islamic extremists, only to have politicians who had no understanding of the military and little of world politics give back all gains? How many times had politicians, elected solely on charisma and domestic policy expertise, made tragic blunders, totally avoidable tragic blunders, leaving the soldiers in the field to twist in the winds of political expediency? Spilling blood to protect the homeland was one thing. But spilling blood, only to then vacate hard-won gains on a whim and leave a vacuum that ended up making the problem far worse, was another. It made Blake physically ill. Hiding one’s head in the sand and ignoring reality wasn’t going to make the problem go away. And it was maddening how often the civilized world allowed itself to be duped by barbarians with no ethics or morals. By savages who would do anything for their cause. Literally, anything. They placed no value on human life, and no act, no matter how savage or despicable, was off limits, including genocide. Many in the West, compassionate but misguided, were determined to bend over backwards to understand the extremists, to empathize with them. But there was no understanding an ideology this rabid, this diseased. Who could understand a woman who would strap a bomb on a child and send him or her into a crowded square? These extremists had been brainwashed by a sick, close-minded, hateful ideology. Some in the West believed that poverty was responsible, that America was somehow at fault for hoarding so much of the world’s resources. But many of the extremists were well-off, as Bin Laden had been. And hundreds of millions of people around the world lived in squalor, but had never resorted to sawing off heads and burning men alive. If an American soldier was too decent to shoot through these helpless human shields he would die. If he did defend himself and a civilian was killed, this would appear on news programs around the world as yet another example of the cruelty and overzealous nature of the American military, of the barbarity of the American soldier, emphasizing the plight of the poor freedom fighters whose countries they were invading. There are so many genres and subgenres today that it's easier than ever to find the right kind of stories we enjoy reading. When I was a kid, technothrillers were simply science fiction books. Little green men and titanium alloy men all bundled up together in the same category. Finding the 'sciency' ones instead of the 'fantasy' ones was like a pot-luck dinner. Split Second is a sciency one. Not as hard to find now because it's labeled correctly under technothriller or sci-fi thriller. I listened to it on Audible. Even though there was nothing wrong with the narration, I wish I had read it instead. There was a lot of science and pseudo-science to wrap your head around. For me, that's easier when I read than when I listen. Richards admits to striving to make his novels fascinating, thought-provoking, and even controversial. He succeeds!!! If Richards writes all his novels like this one, I may have to start reading his work exclusively. It is utterly unique and fascinating. An original and mind boggling spin on time travel with lots of action and feelz as a bonus. This review has been hidden because it contains spoilers. To view it, click here. This is the first book I've ever listed as 'read' without finishing it. I'm listing it such because I've gotten 65% of the way through and just can't keep going anymore - but want the credit against my reading goal. This was a trial. The book could have been written by taking ten words from the start of any sci-fi novel and running a Markov chain off of those words. I'm torn as to my favorite part - was it where in the first chapter he used two pages to summarize the plot of the movie Idiocracy? This is the first book I've ever listed as 'read' without finishing it. I'm listing it such because I've gotten 65% of the way through and just can't keep going anymore - but want the credit against my reading goal. This was a trial. The book could have been written by taking ten words from the start of any sci-fi novel and running a Markov chain off of those words. I'm torn as to my favorite part - was it where in the first chapter he used two pages to summarize the plot of the movie Idiocracy? Was it the three (so far) interludes about Radical Islamic Terrorists and how the West Just Doesn't Understand that These People Are Horrible? Torn, I say. Even those two sins could be overlooked if the main characters had anything interesting or unique about them at all. Our heroine exists as a reader-proxy who seems to immediately forget that she didn't live life as an action hero all the time up to the start of the book, and her plucky associate The Consummate Professional is a similarly dull seen-it-all military man with a conscience, who abhors killing but recognizes its necessity - They're just randomly selected characters from the action movie stock, with personal details that have been filled in as Mad Libs are - existing as details, but not affecting the overall context in the slightest. If we're going hard on the central concept of the book, things break down even further. The book attempts to do something Cool with time travel - it's only a half second, what could the use be - but then undermines this potentially cool concept by trying to be more clever about space than you can actually be. An item is sent 45 microseconds into the past, and appears that amount of time ago - "but the object only moved through time, not space - so it appears far away from where you initially sent it back." Through massively convenient mechanics, the object you sent back won't appear deep underground or high up - nope, time travel gods deem that it'll appear on some nearby surface, provided that a convenient surface exists. If you're OK with that, it gets worse. You've got a can, and you want two cans. "I will send this can back in time to now, in half a second" you say. A can appears, and you change your mind about sending the original back. You now have two cans. Neat. The book addresses the obvious paradox by saying that the source universe (the one that sent the can back) ceased to exist when it interfered with its own timeline, so you can use this process to infinitely duplicate any object. The moment you switch this machine on, you not only create a number of duplicates of whatever item you were going to send back, but you also know what "not moving" looks like - the opposite of the vector the item you sent back appeared on. And once you know what "not moving" looks like, you have a way to objectively check your reference frame, and relativity breaks down. Which I guess is minor, because we're talking about destroying several universes to duplicate cans or whatever. Ooof, this one was rough. I don't know what compels me to read books I KNOW will be hot garbage. Sometimes you want to just turn off the ol' brain and let the hours aloft in an airplane fly by, I suppose. But this book I read - for the most part - on terra firma so I don't have any excuse. I am a notable sucker for time travel stories, so when I read the blurb that mentioned it, I was on board. And I DID get a kick out of the sci-fi thought experiments peppered throughout the narrative. Thus: tw Ooof, this one was rough. I don't know what compels me to read books I KNOW will be hot garbage. Sometimes you want to just turn off the ol' brain and let the hours aloft in an airplane fly by, I suppose. But this book I read - for the most part - on terra firma so I don't have any excuse. I am a notable sucker for time travel stories, so when I read the blurb that mentioned it, I was on board. And I DID get a kick out of the sci-fi thought experiments peppered throughout the narrative. Thus: two stars. No rating: did not finish. Wow, what crappy writing. Tell, don't show: long paragraphs of background information inserted into dialog between characters, sometimes entire chapters. A few action scenes here and there, but not enough to get me through all the explanatory dialog. People just don't talk like this, unless to themselves. Richards gets carried away with his explication: at one point he actually forces a character to define what another character calls a "ranch-style house": "Oh, you mean No rating: did not finish. Richards gets carried away with his explication: at one point he actually forces a character to define what another character calls a "ranch-style house": "Oh, you mean a one-story detached dwelling." He goes on to have the characters, who are supposed to be running for their very lives, discuss the high price of housing in southern California, even for basic "track homes." This book was not for me. I felt that the author overspent time in the book trying to flesh out the characters. Usually, I enjoy an author doing that, but in this book it felt really unnecessary and a lot like it was padding the book. Spending a chapter on characters political beliefs, only to never reference it again seems like a waste and something that could have been edited out. The book does move along pretty quickly as it is written like a thriller, and while there were some plot twists du This book was not for me. I felt that the author overspent time in the book trying to flesh out the characters. Usually, I enjoy an author doing that, but in this book it felt really unnecessary and a lot like it was padding the book. Spending a chapter on characters political beliefs, only to never reference it again seems like a waste and something that could have been edited out. The book does move along pretty quickly as it is written like a thriller, and while there were some plot twists during the book none of them felt very earth shattering in my opinion. I almost put the book down after the pointless anti-Islamic screed at the beginning of the book. That probably colored the rest of my experience, but I just didn't enjoy it. I thought to myself some brain candy would be good, got a copy for $.99, a plot about a new take on time travel sounded fun. Maybe something fun and entertaining like a Clive Cussler novel, my not so secret vice. Shame I couldn't get past an entire chapter that was little more than an unvarnished jingoistic diatribe to see what the take was. I'm used to authors incorporating their political or personal beliefs into their stories (Dan Simmon's Flashback being a recent example), but typically they I thought to myself some brain candy would be good, got a copy for $.99, a plot about a new take on time travel sounded fun. Maybe something fun and entertaining like a Clive Cussler novel, my not so secret vice. Very amateurish writing, characters are unbelievable (one minute she's a normal woman, the next she's an action hero), and a poor grasp of technology (really - you threaten to drop a flash drive into a glass of wine and stop the bad guy? I've washed one of mine TWICE and didn't lose a bit of data). All in all a lousy read which I couldn't finish. Split Second is a book about time travel… but not really. What if you couldn’t go back to the age of the dinosaurs, or even watch your birth. But, you could only go back a fraction of a fraction of a second. Literally less than a blink of an eye. What good would that do? Apparently, two rival corporations and agencies know what, and will kill to find out more. The narration was done by Kevin Pariseau was excellent. The hard science within this could have been a tongue twister for many narrators and readers alike, and Pariseau cruised through it like a hot knife through butter. Pariseau’s voice was perfect for this, sophisticated and smart. The accents he uses and the different dialects were all really well done and added to the story nicely. Okay, I took a night to compose myself from this book, it made me feel and think things that books don’t normally do. I’m a fan of the technothriller genre. Ever since I started reading Michael Crichton, I was hooked. He just had a way of writing both scientifically compelling and incredibly thrilling fiction. I’ve found a few authors since then that fit the bill and seem to quench my insatiable thirst for more Crichton (RIP). But, Richards may be my new key. 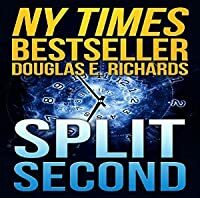 Split Second was a book that started out with a bang, literally — a murder of a top physicist who was working on a new theory that he had only shown to one person. From there it was an incredible whirlwind of great storytelling and character development. Character-wise, Aaron Blake needs to be seen again, I’m not sure if Richards even writes with certain characters in mind, but Blake was amazing. He was absolutely everything you would want out of a protagonist: smart, cunning, incredibly good at getting out of bad situations–what more could you ask for? Seriously, Aaron Blake needs another novel! Jenna Morrison’s character was really interesting too, she had gone through so much in such a short amount of time that it was really fun to watch her characters developmental arc. The two main antagonists were also amazing, and one of them turns out not the way you expected them to be. Always wonderful when a book can misdirect you like that without leaving you feeling betrayed. Overall, the story itself was the main blockbuster here, but the supporting cast makes this an easy 5-star book. Douglas E. Richards has skyrocket to the top of my authors list and I will be voraciously reading his other books now. Physicist Nathan Wexler discovered how to send matter back one-half second in time. Doesn't sound like much, does it? But the mathematics involved are of desperate interest to two separate groups, both of which are willing to go to any lengths to get their hands on Dr. Wexler and his equations. Wexler and his fiancée, Jenna Morrison, are kidnapped at gunpoint by one group and "rescued" by the other, but the rescue goes horribly horribly awry, and now Jenna is on the run. Alone. The first half of Physicist Nathan Wexler discovered how to send matter back one-half second in time. Doesn't sound like much, does it? But the mathematics involved are of desperate interest to two separate groups, both of which are willing to go to any lengths to get their hands on Dr. Wexler and his equations. Wexler and his fiancée, Jenna Morrison, are kidnapped at gunpoint by one group and "rescued" by the other, but the rescue goes horribly horribly awry, and now Jenna is on the run. Alone. The first half of the novel has to do with Jenna retrieving Nathan's math. Although it's revealed in the cover blurb, it isn't until we're halfway through the novel that the big time-travel idea makes its debut. The last half of the novel involves our heroine and her new-found protector, Aaron Blake, trying to stay out of the hands of the two mysterious factions after the time-travel formula. Car chases and hand-to-hand fighting and explosions abound. As I read this, I was reminded of why I usually don't read mass market genre fiction. Oh, it was a serviceable enough story, but predictable, cliché-ridden, and to tell the truth, so awful I could barely stand it. The reader is told on countless occasions -- in fact, is nearly pounded over the head with the fact -- that Nathan and Jenna both have incredibly unbelievably brilliant brilliant brilliant intellects; they must be the brightest people to have walked the face of the earth since Leonardo da Vinci. Plus, their colleagues' brilliance is dimmed only by the supernovae that are Nathan and Jenna. And the former Special Forces/Black Ops-soldier-turned-private-detective, Aaron Blake? Wow, he's just the most amazing, clever, resourceful reconnaissance-and-getting-out-of-scrapes guy ever! By the time the time travel formula and its uses made an appearance, the only reason I was still reading was because I hadn't figured out which group chasing our heroes were the good guys. But, if you like predictable clichés, hyper-brilliant scientists, and lots of action and explosions, then this is the story for you. This is a good book, somewhat similar to one I read by another author. If you find the theory of time travel, and teleportation interesting, then this is the book for you. They only issue I had with this is they get very technical and theoretical, which was OK for me, but some people would not find this interesting. When I tried to discuss it with my daughter she started snoozing. So, you really need to be interested in this type of subject. There is a love story, intrigue,kidnapping and fightin This is a good book, somewhat similar to one I read by another author. If you find the theory of time travel, and teleportation interesting, then this is the book for you. They only issue I had with this is they get very technical and theoretical, which was OK for me, but some people would not find this interesting. When I tried to discuss it with my daughter she started snoozing. So, you really need to be interested in this type of subject. There is a love story, intrigue,kidnapping and fighting involved in the overall story as well. It starts off really exciting and action pact. This is continued with the book and at the end. I like how things worked in the end, but do not want to reveal this to anyone. I really wanted to like this more than I did, and I think it's because the author thinks he's just a bit smarter than even his smartest readers, and it comes through in his storytelling. It wasn't exactly condescending, but there was a lot of, "are you still with me folks? Did my big brain lose you back there?" going on, even to the point of there being a fairly lengthy after-story section on what science in the book was real and what he made up. Yeah, I had that sorted out already, and I'm only I really wanted to like this more than I did, and I think it's because the author thinks he's just a bit smarter than even his smartest readers, and it comes through in his storytelling. It wasn't exactly condescending, but there was a lot of, "are you still with me folks? Did my big brain lose you back there?" going on, even to the point of there being a fairly lengthy after-story section on what science in the book was real and what he made up. Yeah, I had that sorted out already, and I'm only a BS Biologist. He also seems to think that he's the first person to come up with the idea that time travel can lead to duplication. I offer him The Prestige by Christopher Priest, which also was made into a movie with a lovely small roll played by the late, great David Bowie. It was published quite a long time before Split Second. My 45 micro-second review: A fun, light, and somewhat sophomoric techno-thriller built around a quirky spin on time travel. 3-1/2 stars. Just the right mix of sci-fi and thriller. The characters are enjoyable and the author maintains a good pace throughout. I really enjoyed the afterword in which the author separates scientific fact from speculation and elaborates on the various current scientific theories (as in educated hypothesis, not Relativity) that he makes use of in the book. I really wanted to like this book but it was just awful. I honestly haven't finished and I'm not sure that I'm going to be able to. I listened to the audio book (don't do it, the narrator is worse than the writer) and I will say I think that definitely influenced my inability to like the book. My dislike started with the author's ridiculous need to explain to us what a "thumb drive" is. My 75 year old grandmother knows what a USB stick is. Really? That needed explaining. He continues this way m, I really wanted to like this book but it was just awful. I honestly haven't finished and I'm not sure that I'm going to be able to. I listened to the audio book (don't do it, the narrator is worse than the writer) and I will say I think that definitely influenced my inability to like the book. My dislike started with the author's ridiculous need to explain to us what a "thumb drive" is. My 75 year old grandmother knows what a USB stick is. Really? That needed explaining. He continues this way m, explaining basic everyday things as well as characters' backgrounds. He spends what feels like pages describing useless back story that has no real use later in the book. Also, by far the most annoying part of the book is everybody's seemingly outstanding intellect. He tells us how smart, sharp, and amazing everybody is at least once every few pages it seems. AND he often does this after trying to emphasize unimpressive feats. A reviewer compared this author to Michael Crichton. Really? It was all I could do to finish this. I remember getting it because it had a time travel aspect and even though I'm not a sci-fi fan, I am interested in time travel. What I got was a poorly written book with underdeveloped, cliched characters and multiple long paragraphs, pages even, about dark matter, paradoxes and probably the entire history of time travel experimentation. It is a bad guys vs. good guys situation with chases and bomb A reviewer compared this author to Michael Crichton. Really? It was all I could do to finish this. I remember getting it because it had a time travel aspect and even though I'm not a sci-fi fan, I am interested in time travel. This story provides a healthy dose of 'what-if' philosophizing about the consequences of backward time travel. It provided fodder to get me thinking about physical aspects I had not thought of before. While these time-travel scenarios remain hypothetical and exist only in science fiction stories, any book that causes me to think through logic problems this much is a win. It is one of the great things books are supposed to do: get you to think about different things in different ways. On the down This story provides a healthy dose of 'what-if' philosophizing about the consequences of backward time travel. It provided fodder to get me thinking about physical aspects I had not thought of before. While these time-travel scenarios remain hypothetical and exist only in science fiction stories, any book that causes me to think through logic problems this much is a win. It is one of the great things books are supposed to do: get you to think about different things in different ways. I was already considering pitching this across the room due to its juvenile writing style when the PI with white nationalism nationalist yearnings to wipe out Islam entered the story. Goodbye, good riddance. An enjoyable read, but the time travel twist is truly brilliant. I read reviews that said it was unique, and I thought they just hadn't read enough sci-fi, but no, this really is an incredible concept. Douglas E. Richards was born on May 7th, 1962. He grew up in Cincinnati, Ohio with his parents and his sister, Pam. He went to Finneytown High School, and then graduated with a degree in microbiology from Ohio State University, a master's degree in molecular biology from the University of Wisconsin, and a master's degree in business administration from the University of Chicago. Douglas now lives Douglas E. Richards was born on May 7th, 1962. He grew up in Cincinnati, Ohio with his parents and his sister, Pam. He went to Finneytown High School, and then graduated with a degree in microbiology from Ohio State University, a master's degree in molecular biology from the University of Wisconsin, and a master's degree in business administration from the University of Chicago.